Part of the larger family of the Echinodermata, These include Brittle stars, Crinoids, Sand Dollars, Sea Urchins, sea cucumbers etc. STARFISH / BRITTLESTARS are on their own page. 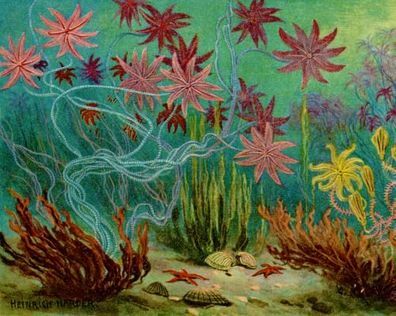 The earliest echinoid fossils date to the upper part of the Ordovician period (circa 450 Mya), and the taxon has survived to the present as a successful and diverse group of organisms. Spines may be present in well-preserved specimens, but usually only the test (shell) remains. Isolated spines are common as fossils. Some echinoids (such as Tylocidaris clavigera, from the Cretaceous period's English Chalk Formation) had very heavy, club-shaped spines that would be difficult for an attacking predator to break through and make the echinoid awkward to handle. Such spines simplify walking on the soft sea floor. Sand dollars first evolved during the Eocene. Eupatagus antillarium, Sea Urchin, Jacksonville, Florida, United States. Eocene age (38 Million years old). Clypeus Plotii, the Classic British Jurassic Echinoids, "Chedworth Buns"
Clypeus Plotii (named after Sir Thomas Plot) are the classic British Echinoid that most want in their collections. They are middle Jurassic and around 165 Million years old. Found in the Clypeus Grit member, Salperton Limestone formation, Salperton, Gloucestershire. Truly beautiful specimens below, some of which are Polished to bring out the finest details and affordably priced samples too. Very few of these are being found now and the original sites for collecting have almost closed. Pliocene Sand Dollars, Millitella californicus, comes from near El Golfo de Santa Clara, Baja California, Mexico. They have been polished with beeswax to keep them clean and free of dust. Micraster coranguinum and Echinocorys sp (when available). These are Cretaceous in age, Campanian-Maastrichtian stage. Very detailed and contrasting colours. They were found in Santander, Spain. A Clypeus related Echinoderm species. Callovian age, Middle Jurassic, Lit de la Lomaka, Madagascar. Beautifully polished A Grade specimens. These specimens below are a must for the collector of fine Sea Urchin Fossils. Some B Grade samples are available too.